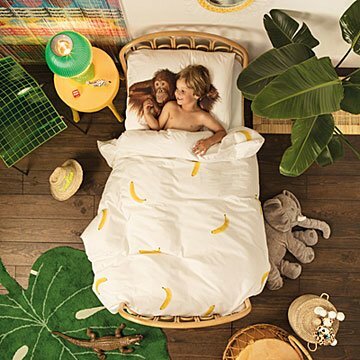 Turn bedtime into a jungle adventure with this wild bedding set. Your little one may be a monkey on the playground, but you should see the wild adventures they get up to in their dreams! Make sure they're properly outfitted for the next naptime quest with this playful bedding set by Peggy van Leer and Erik van Loo. Featuring a high-quality print of a friendly orangutan to snuggle up with on the pillow, and a feast of bananas on the duvet, slipping off into the jungles of dreamland has never been so fun. Designed in the Netherlands. Made in Portugal.